In Brief: Two days in the Badain Jaran desert with an overnight camp, peaking with an ascent of one of the world’s tallest dunes; three days looking about nearby scenic and historical highlights including the Zhangye Danxia Landform. A desert lake, seen from the peak of a tall dune. Head west to spend two days hiking, driving, and camping in the Badain Jaran desert, peaking with a challenging ascent of the world’s third-tallest sand dune. Not far from the desert are the cities of Zhangye and Jiayuguan, both important stops on the Silk Road, and both full of important historical sites. While we’re out there, why not visit? On the days either side of our desert adventure, we’ll tour the fortress at Jiayuguan, take a long hike through the stunning scenery of the Zhangye Danxia Landform, and make a side trip to Zhangye’s Giant Buddha Temple. Day One Fly to Jiayuguan, visit Jiayuguan Fortress, overnight in Jiayuguan hotel. Day Two Drive to Zhangye Danxia Landform for a three-hour hike, picnic lunch, overnight in Zhangye hotel. Day Three Drive into the desert, picnic lunch, hiking and more driving through the dunes, dinner at campsite, overnight in tents. Day Five Visit Zhangye’s Giant Buddha Temple, drive to Jiayuguan, fly back to Beijing. We’ll be visiting the Badain Jaran Desert, which covers parts of Gansu and Inner Mongolia. It’s the third largest desert in China, with an area of 49,000 square kilometers – quite a bit bigger than the Tengger Desert, which we’ve visited on different desert trips. 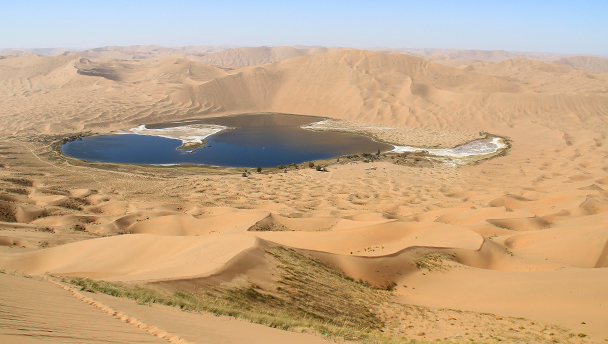 Badain Jaran is a Mongolian name for the desert, and it means “mysterious lakes”. There are more than 100 lakes in this part of desert – all spring-fed, some salt water, some fresh water. Sometimes in this area you’ll hear what’s called the “singing sand”, a weird rumbling noise made for reasons not yet fully understood. We haven’t heard it ourselves, but we’ll be keeping our ears open. Climb Bilutu Peak, the third-highest sand dune in the world. Bilutu Peak is the world’s tallest stationary sand dune, and the third-tallest dune in the world. In a stationary sand dune the inner layers of the dune are all compacted, sometimes to the point where sandstone has been formed. Only the top layer of sand shifts. From top to bottom Bilutu Peak measures some 300 metres, and the altitude at the top is roughly 1,605m above sea level. Three-hundred metres doesn't sound so high, but it's a tough climb in the sand! From the top – or from perhaps near the top! – we’ll get a view of the surrounding desert and quite a few of the mysterious lakes. Compared to other dunes around the world, Bilitu Peak is the third-highest above sea level, and it's also in third place for its prominence (the difference in height between base and peak). The information about Bilutu Peak on Wikipedia doesn't quite match up with what we recorded on our GPS: Wikipedia has the ‘Badain Jaran’ dunes at 2,020m above sea level, with a prominence of 500m; our GPS measured the peak at 1,605m above sea level with a prominence of 323m. We might have started our climb in a different spot to the actual base of the dune, but the altitude reading is hard to argue with. The Zhangye Danxia Landform is characterized by magnificently multi-coloured sandstone hills and mountains that ripple away towards the horizon. We’ll do a nice long hike in this area on the second day of the trip, packing a picnic lunch to allow us to venture deeper into the hills. Jiayuguan Fortress is known as the westernmost end of the Ming Dynasty Great Wall, and was one of the most important fortifications of its time, guarding the western entrance of the Hexi Corridor, the main route into China from the west. The fortress has three defense lines – a moat, an outer city wall, and an inner city wall. There are gates on the east and west side. The fortress looks spectacular, with Great Wall climbing from it to the mountains in the north and south, and multi-storey towers and halls inside the walls and moat. We'll visit here on the first day of the trip. Built in 1098 AD, and extended and renovated during the Ming and Qing Dynasties, Zhangye’s Giant Buddha Temple houses the largest indoor reclining Buddha in China—nearly 35 metres from head to toe. The reclining pose signifies entry into nirvana. We’ll also see a variety of temple architecture, with the Ming and Qing Dynasties represented, amongst others. We’ll visit the temple on the last day of the trip. The temperature in deserts will usually vary greatly between the night time and daytime. In August it's dry and we expect daytime temperatures of around 20-30°C, with temperatures of around 16-20°C at night. Even though it is a sandy desert, please be prepared to dress warmly. It is not expected to rain, although rain is not impossible. At this time of year, the chance of sandstorms is low, but we still need to be prepared. In Jiayuguan and Zhangye, the temperatures in August are usually between 30°C and 12°C, but the records from previous years note that there's the chance of the occasional very cold day or very hot day. We will spend two nights in local 4-star hotels, and one night camping in the desert under the stars! Tents, sleeping bags, sleeping bag liners, and ground mats will be supplied by Beijing Hikers. At the hotels, you’ll be sharing a room with another hiker. If you'd like a hotel room to yourself, it can be arranged at an extra cost of 600 RMB for the trip, if rooms are available—usually not a problem! We’ll be traveling by plane from Beijing to Jiayuguan and back again at the end of the trip. We’ll hire a private bus to transit between destinations. There will also be a section of the trip that will include jeep travel through the desert, perhaps a rough ride if you are prone to motion sickness. Simple breakfast and picnic lunches will be provided while we’re in the desert, as will dinner at camp on day two. At other times, we will take our meals in restaurants – either at the hotel, or nearby. Bring some spending money for snacks during the trip. We’ll be eating Chinese-style food. Please let us know if you have any special dietary requirements or food allergies. Bring a day pack for carrying water and snacks while hiking, and a duffle bag or suitcase for the rest of your things. Your extra luggage can be left on the jeeps or at the hotel. Photos from our hike in the Zhangye Danxia Landform and ascent of the world’s third-tallest sand dune.